Paulownia tomentosa is a small to medium sized tree, native to Asia that was introduced to North America as an ornamental but is now also commercially farmed. 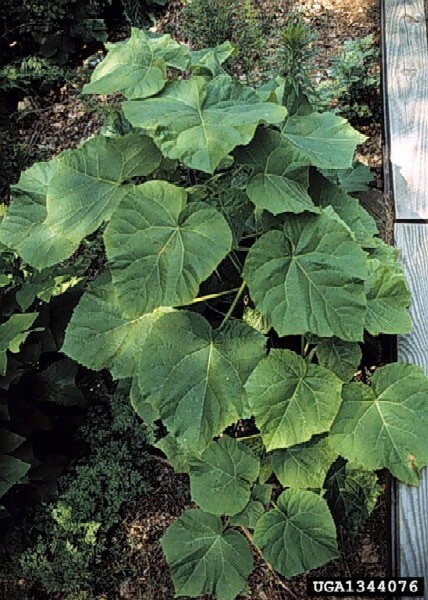 Paulownia tomentosa grows best on moist, well-drained soils on steep slopes or open valleys, but it can also establish itself readily on poor quality sites, such as abandoned surface mines, along roadways, railways and steep, rocky waterways. 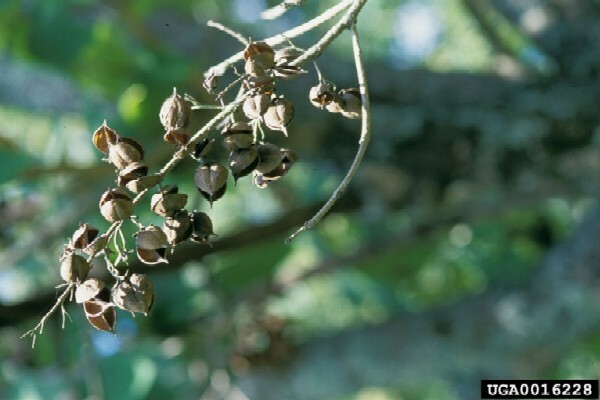 Paulownia tomentosa is considered to be an aggressive ornamental tree that grows rapidly in disturbed natural areas. Remaley (1998) reports that P. tomentosa \"is a small to medium sized tree in the figwort family (Scrophulariaceae) that may reach 9-18 metres in height. The bark is rough, gray-brown, and interlaced with shiny, smooth areas. Stems are olive-brown to dark brown, hairy, and markedly flattened at the nodes. Leaves are large, broadly oval to heart-shaped, or sometimes shallowly three-lobed, and noticeably hairy on the lower leaf surfaces. They are arranged in pairs along the stem. Conspicuous, upright clusters of showy, pale violet, fragrant flowers open in the spring. The fruit is a dry brown capsule with four compartments that may contain several thousand tiny winged seeds. Capsules mature in autumn when they open to release the seeds and then remain attached all winter, providing a handy identification aid.\"
Remaley (1998) states that \"P. tomentosa trees start bearing seed after 8 to\r\n10 years and are very prolific. . . . The seeds of P. tomentosa germinate\r\nquickly and grow rapidly when conditions are favourable. The seeds show\r\ninduced dormancy and require light for germination. Laboratory studies have\r\nfound that light and many other treatments can cause germination. Cold\r\nstorage reduces the light requirement, however. Germination is epigeal. P. tomentosa is promoted as a fast growing timber tree, although the fast growth makes for a soft timber which limits its usefulness. It grows more slowly in its native region (China, Japan) where it is used as a cabinet timber and for musical instruments. Bonner (1990) states that P. tomentosa \"was introduced into this country as an ornamental, and it still retains some popularity for that purpose. Its use in reclamation of the disturbed soils of surface mines grows yearly. The wood is highly prized for the manufacture of specialty items in Asia, and there is a brisk export business of logs to Japan. The export market has led to establishment of commercial plantations.\"
Remaley (1998) reports that P. tomentosa \"grows rapidly in disturbed natural areas, including forests, stream banks, and steep rocky slopes.\" Bonner (1990) states that \"in China, the natural range is south of the 0° C January isotherm in areas which receive an annual rainfall of at least 1020mm. Naturally seeded or planted P. tomentosa survives and grows best on moist, well-drained soils of steep slopes or open valleys, but it will germinate and grow on almost any moist, bare soil. A highly adaptable 'escapee' such as P. tomentosa is found in many site, soil, and forest type conditions, including soils commonly found in the order Alfisols. Like most pioneer species, P. tomentosa needs bare soil, sufficient moisture, and direct sunlight for good seedling establishment. Seedlings are very intolerant of shade. The ability of P. tomentosa to survive, grow, and reproduce on such harsh, exposed sites, however, has made it a favourite for re-vegetating surface mine areas. The tree thrives on dry southern aspects, even though it generally has a shallow root system.\" The Southeast Exotic Pest Plant Council (Undated) reports that P. tomentosa \"tolerates high soil acidity, drought, and low soil fertility.\"
Remaley (1998) states that P. tomentosa also spreads by seed and by\r\nsuckering. \"Each [seed] capsule contains up to 2,000 seeds, and a large tree\r\nmay produce as many as 20 million seeds a year. As the capsules break open\r\non the trees throughout the winter and into spring, wind dissemination\r\noccurs easily. . . . P. tomentosa roots sprout easily. In fact, lateral root\r\ncuttings of 1-year-old seedlings can be used for propagation directly in the\r\nfield.\" Further research has found that large capsules may contain > 2,500\r\nseeds and that seeds can remain in a seed bank for at least 3 years becoming\r\ndormant sometime in the late summer with very little seed predation\r\n(Longbrake, pers. obs.). P. tomentosa was introduced into the USA as an ornamental, and it still retains some popularity for that purpose (Bonner, 1990).The wood of P. tomentosa is highly prized for the manufacture of specialty items in Asia, and there is a brisk export business of logs to Japan. The export market has led to establishment of commercial plantations (Bonner, 1990).P. tomentosa's use in reclamation of the disturbed soils of surface mines grows yearly and this has led to its spread (Bonner, 1990). Review: A. Christina W. Longbrake, Washington & Jefferson College, Department of Biology. 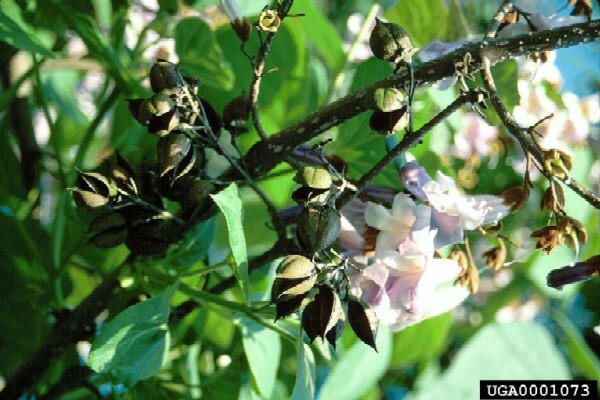 Recommended citation: Global Invasive Species Database (2019) Species profile: Paulownia tomentosa. Downloaded from http://www.iucngisd.org/gisd/species.php?sc=440 on 21-04-2019. Remaley (1998) reports that P. tomentosa \"is an aggressive ornamental tree that grows rapidly in disturbed natural areas . . .\" The Southeast Exotic Pest Plant Council (Undated) reports that P. tomentosa \"can also colonize rocky cliffs and scoured riparian zones where it may compete with rare plants in these marginal habitats.\"
Preventative measures: A Risk Assessment of \r\r\nPaulownia tomentosa for Hawai‘i and other Pacific islands was prepared by Dr. Curtis Daehler (UH Botany) with funding from the Kaulunani Urban Forestry Program and US Forest Service. The alien plant screening system is derived from Pheloung et al. (1999) with minor modifications for use in Pacific islands (Daehler et al. 2004). The result is a score of 9 and a recommendation of: \"Likely to cause significant ecological or economic harm in Hawai‘i and on other Pacific Islands as determined by a high WRA score, which is based on published sources describing species biology and behaviour in Hawai‘i and/or other parts of the world.\"
A Risk assessment of \r\r\nPaulownia tomentosa for Australia was prepared by Pacific Island Ecosystems at Risk \r\r\n(PIER) using the Australian risk assessment system (Pheloung, 1995). The result is a score \r\r\nof 7 and a recommendation of: reject the plant for import (Australia) or species likely to \r\r\nbe a pest (Pacific). Physical: Remaley (1998) States that P. tomentosa, \"can be controlled using a variety of mechanical and chemical controls. Hand pulling may be effective for young seedlings. Plants should be pulled as soon as they are large enough to grasp. The entire root must be removed since broken fragments may re-sprout. Cutting is most effective when trees have begun to flower to prevent seed production. Because P. tomentosa spreads by suckering, re-sprouts are common after cutting.\"
Chemical: \"Cutting should be considered an initial control measure that will require either repeated cutting of re-sprouts or an herbicidal treatment. Girdling is effective on large trees where the use of herbicides is impractical. This method will kill the top of the tree but re-sprouts are common and may require a follow-up treatment with a foliar herbicide. The cut stump method, that is applying herbicide to freshly cut stumps, should be considered for individual trees or when desirable plants are nearby that might be impacted by foliar applications\" (Remaley, 1998). Informations on Paulownia tomentosa has been recorded for the following locations. Click on the name for additional informations. Batianoff, George N. and Butler, Don W. 2002. 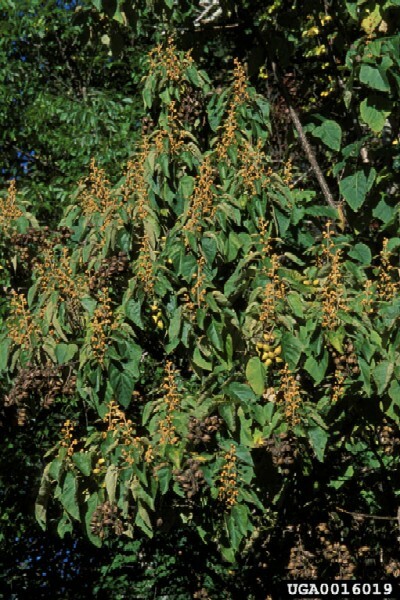 Assessment of Invasive naturalized plants in south-east Queensland. Appendix. Plant Protection Quarterly 17, 27-34. Summary: Information on habitat, life history, special uses, and genetics of species. Available from: http://www.na.fs.fed.us/spfo/pubs/silvics_manual/Volume_2/paulownia/tomentosa.htm [Accessed 12 October 2003]. Available from: http://www.hear.org/pier/species/paulownia_tomentosa.htm [Accessed 5 February 2003]. Remaley, T. 1998. Princess Tree: Paulownia tomentosa (Thunb.) Sieb. & Zucc. ex Steud. Plant Conservation Alliance, Alien Plant Working Group: Bureau of Land Management, Washington, DC. Summary: Information on native range, description, ecological threats, distribution, habitat, background, and current management strategies of species. Southeast Exotic Pest Plant Council. UNDATED. Invasive Plant Manual, Common Name: Princess Tree. The Bugwood Network: University of Georgia, College of Agricultural and Environmental Sciences. Available from: http://www.se-eppc.org/manual/princess.html [Accessed 12 October 2003]. 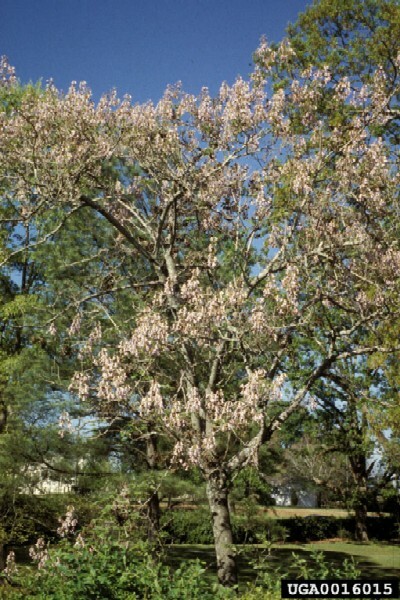 Summary: Available from: http://plants.usda.gov/java/nameSearch?mode=Scientific+Name&keywordquery=Paulownia+tomentosa&go.x=11&go.y=10 [Accessed 24 March 2006]. USDA-GRIN (Germplasm Resources Information Network) 2003. 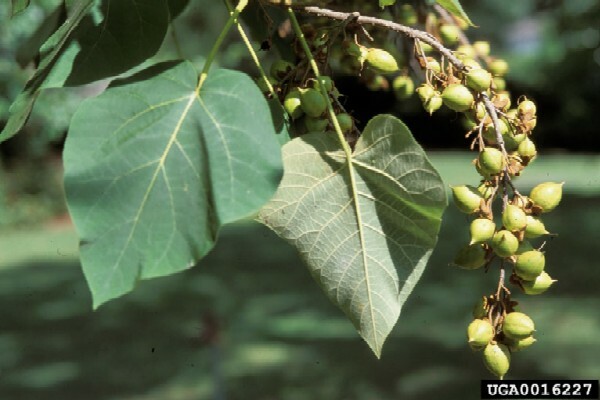 Taxon: Paulownia tomentosa. National Genetic Resources Program [Online Database] National Germplasm Resources Laboratory, Beltsville, Maryland. Available from: http://www.ars-grin.gov/cgi-bin/npgs/html/taxon.pl?27045 [Accessed 12 October 2003].